There's a lot of maps where having lasers on them would help improve running them immensely. In order to do the above, you're mostly likely going to need to setup your own dedicated TF2 server which is pretty easy and install metamod and stripper. If you need help with that I can point you in the right direction for installing the addons and such. Below is the stripper code for one laser beam point. Okay, so I didn't know which maps you were thinking of when you said some of them need to have lasers on them. So I did the ones that I could think of needing some. Please develop which maps you were thinking about so I can know how to help. please also tell me how functional what I tried to make is. All I did was decompiling the maps, placing in the lasers and target, then compiling the map. Then, I extracted the .ent file containing all the info about the entities in the map (Stripper probably edits this file in order to get modifiction to work in-game) and copied the lines referring the lasers and target added in the level. You can change "rendercolor" "128 255 0" with whatever you want. 128 255 0 is just a suggestion. I made the lasers blue on kitsune2_tf2 though because I thought it was more apropriate to the map's theme on this stage. Make also sure "spawnflags" "1" is set to 1 on the env_laser entities because if they are set to 0, they will start off and probably nothing will turn them on. Lasers highlighting the border of the trigger on stage2 shortcut. Lasers highlighting the edges of the triggers on below the first ramp of stage 5 and the inside loop of stage 6.
same as derpis_h, except that there is a shortcut possible on stage 3 where you go below first ramp from the side around the trigger (fixed in the _h version, thanks to Pickles). There is a "U" shaped leak in the triggering of the second part allowing you to skip the two last jump of it. I highlighted it with lasers. Lasers highlighting the outside of where to go in order to take the shortcut that is hidden in the ground. Lasers showing the size and location of the gap in the window shortcut near the start of the map. Last edited by Shadow Sheep on Sun Feb 14, 2016 8:46 am, edited 1 time in total. I don't really know what maps actually require lasers. I'm hoping some people who read the forums might put in some suggestions for maps that really need it. I have an hour to kill so I'll throw some of these up and take a look. edit: Probably shouldn't have done so many sheep, since env_beam is what we want vs env_laser. That was my bad, i didn't realize that and env_beam is solid where env_laser flickers and is annoying. If you would be able to convert those to env_beams update your post, that would be great. Also did you do S3 derpis sc lasers? That was the first one I went to and didn't see them, but i saw them on S6. I also think you messed up your formatting a bit, there was surf_insideout on surf_derpis config. Env_beam and env_lasers are actually very similar. You can make both of them not flicker by replacing "TextureScroll" "35" with "TextureScroll" "0". They both use the same texture that is not a perfectly flat line, so scrolling it gives that flickering effect. If you set it to 0, it will stand perfectly still for both entities. You can see env_laser way better than env_beam, but the player can cut the laser with his body while env_beam can go through any objects, including walls. Since in most case, you can stand in the laser without touching the trigger next to it, I think env_laser is fine. Unless of course someone starts greifing and stands noclipped in the laser's location. So yeah, tell me the one you prefer, but I by far prefer the brighter one to the can't-obstruct one if they both don't flicker. Also, for the codes, it may be a bit chaotic. I had everything in a 800+ lines files and manually copy-pasted separated parts, so probably mistakes were made. I edited the first post, tell me if its better. Edit: Hi, Shadow Sheep from the future here. I have learnt how to use stripper and since a lot of configs here weren't applied, figured I would write the code directly. Youre welcome! Alright, I have looked a bit into what could be improved with the maps we have and here is what I came up with. Please note that most of it is made using pastebin because otherwise with the 60000 characters limit per post, I probably would have to do at least 3 of them. Maps where we should add lasers to give visual informations as to where things that are not visible are in reality. Note: I didn't recompile the maps I added the lasers in, so I give you the hammer info on them instead (which is pretty similar since you mainly need the names and the origins of the entities anyway). Highlighted the edge on stage 6 when you have to do a 180° turn below a platform because that trigger is tall. Added lasers to show the edges of the playerclips on the bhop bonus. Added several lasers to outline the high triggers of the map. Added lasers on stage 2 to show the limits of where you can go through in the hoops areas. Added lasers to show where are the limits of the triggers on stage 9, 10 and 11. Hilghlighted high triggers with lasers near first ramp and before and after the second to last ramp. Added lasers to highlight high triggers at the first big drop and after the first teleporter near cp1. Added lasers to highligth the limits of the playerclip in bonus 1. Highlighted high triggers near the first and the last square hole you go in in the map. highlighted higher triggers before the cp1 ramp and after the looping ramp. High triggers at the dome room and at the spin after it (second part of the map). High triggers after checkpoint 1 and the tall wall before the huge drop before checkpoint 2. Highleted high triggers at the first slope and on the ground after the 180° curved ramp after checkpoint 1. Also added a red env_beam highliting roughly where thefirst turning right ramp is broken. Highlited where the push up trigger on bonus 2 stops. Obstacles that are not in a consistent place, giving you sometimes fast, sometimes slow options in maps. This map has three issues. The first is that the purple levels have illusionary traps that give no visual information as to how to predict them. The second is that you need to pick between doorways and one of them is randomly picked by the map as a valid one each map start. The third is that the grey stages have moving obstacles that easily can get desync if a player gets them stuck. I suggest removing the illusionary brushes, the randomness and remove the moving objects. The following script removes the func_illusionary blocking the view on the purple stage. The doorways are picked randomly. There is a func_breakable that is invisible, a trigger teleport and a func_illusionray (that never changes) on each of them. The func_breakable and teleport is randmoly chosen to break or block the player/ to not teleport or teleport the player at each map start. Since they all have the same origin at each doorways, so its easy to remove all of them together. For the teleports at the end of the purple stage, I suggest making the logic_auto that is supposed to pick a random one to be enabled to enable them all instead. Maps where there are func_rotating objects that work fine in counter-strike: source, but don't in tf2. Happily, they can be fixed through stripper. The func_rotating are fixed, but the rotate distance is set to "99999999999999999999999999999". Setting all the func_door_rotating distance to "9999999999999999999" instead will make them work properly (and that is still enough to make it spin during 1.76 billion years). 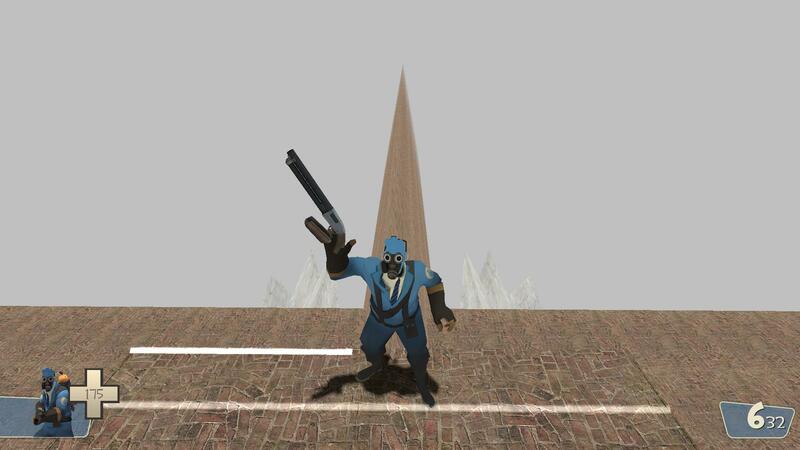 There is a func_brush that is supposed to rotate at checkpoint 1, but this one is solid, meaning that you will collide with it. I suggest setting both of them to not solid. The rotating fans at spawn are fixed, but never told to rotate. Just add this logic_auto to the map. The start zone of stage 2 and stage 3 has a boosting start that regularly stops you because the start zone of the timer is too closse to it. Both start zone should be remade in order to prevent this issue. The end zone of the map is after the door while it completly shouldn't. If you landed on the platform that has the door on it, it means that you totally completed the map. If you type a timaer command teleporting you outside of the upward push area, you get stuck with upward gravity. There should be a trigger at the start zone that sets your gravity to 1 by default in order to prevent this issue. Or kill them for a legit stage completion all the time. The outputs are "Open" for the movelinear and "Enable" for both the brush and the teleport. Its "Kill" for all three to remove them. The start of the map is TH and crouchboost friendly. That should be fixed using a maxvelocity trigger. The map allows a huge skip because of a lack of timer checkpoints. Adding one would fix it. Sometimes, you can telehop through the slown down fall rainbow teleport. Unless this trick can be done consistently, this exploit should probably get fixed. The map used to have a side for each team (red on left side, blue on right side) that you get teleported to when failing wherever you are in the map. I think that should still be the case. For all the triggers that have a "filtername" "CTfilter" that teleport to Jail1 or 2, replace the target to "CTspawn", and do the opostie with all the "Tfilter" teleports. And set its "spawnflags" parameter to 0 so clients can't trigger it. Then, you should manually place a trigger that is hopefully not too big so the issue gets solved. Spots in map starts that are climbed on in order to get a height advantage, and so more speed. Some of them should either be removed, or promoted. You can climb on top of the first ramp, then do a 180° jump into the start zone to get more than a 128 units and 0.4 seconds of advantage at checkpoint 1. You can climb on all the clock supposed to show the time you have left to beat the stage. If you telehop upward, you can climb on the invisible playerclip for a very big height advantage. You can climb on top of the first ramp and 180° in the start zone for some extra speed. You can climb on the pillars at the start to get a height advantage. This only concerns one map for now, but it didn't really fit in the other categories. Basically anything that can make a map less performance consuming for players. It has tons of prop_dynamics that are loaded all the time because the map is a huge room and these props don't fade out with distance. All you have to do is to set their "fademindist" and "fademaxdist" to 10000 or less and then the map shouldrun way better. All the prop_dynamics of the map. Maps that have a telehopped start location but that do not have a !teleport location associated. This map could use a of !teleport boost I think. Even though these would greatly help the server, if anything I talked about was not 100% clear, please ask me about it and it will be my pleasure to develop the parts in question. Last edited by Shadow Sheep on Thu Jan 18, 2018 3:11 pm, edited 6 times in total. I reported surf_forbidden_tomb4 to Zombie yesterday and the playerclip issue has been fixed. Also, for missing_no, there are lights in the tunnel that you have to spin down onto the last ramp that I believe should be func_illusionary rather than solid. The water boost bhops that are in that map are also fairly inconsistent, and there's a really tall trigger on the obstacle you have to avoid right before the ramp with the 2nd water boost bhop. Yeah. I'll take the blame for missing_no...I completely forgot to make the lights illusionary when I converted it to njv...was already compiled and uploaded, didn't feel like doing it all over again for something so trivial. Didn't even think about adding a stripper .cfg to it, either. When porting surf_timewarp, I experimented again the double filtered slanted bhop method that I used in surf_lithium2_fix. Basically, when I fix a slanted bhop, I replace its collision with a flat bhop with a boost on top of it equivalent to the strength of the speed boost the slanted bhop gives you. The issue is that people can crouchboost it easily and get the speed out of it multiple times by bhopping it twice really fast. So the way I had it before was to use a filter system, that makes the trigger_push only accept the person who touched the bhop during 0.15 second (a longer period of time than a cboost/double bhop). This fixes the exploit as if you cboost, the second time you will have the correct filter to use the boost will happen before you will lose the boost filter from the first bhop, which completly negates the double boost effect. The issue of this method is that you get pushed during 0.15 seconds, which can matter a lot of someone who has an high ping with bhops since it adds a lot of lag on the client's perspective (which isn' enjoyable). So I used a double filtered method on surf_lithium2_fix and surf_timewarp in order to cut that pushing delay to 0.02 seconds (0.01 doesn't assure the player to be detected fast enough by the trigger_push because a tick is 0.015 seconds, so you can sometimes lose your filter before the push registered you could use it). I placed a third trigger before the slanted bhop platform which allows you to use the slanted bhop (you can't avoid this trigger or else the bhop wouldn't work if you dodged the third trigger). Then, the second trigger on the bhop platform changes your filter from being able to use this bhop to being able to use the boost, then 0.02 sec later to your default name. The only way to use the slanted bhop again is to go back up and hit the third trigger again, which is why you can put a 0.02 seconds of delay. The issue testers like rez and flamboyant faustino noticed (and that I didn't when testing) is that it in fact only works 80% of the times, meaning that even though all the filtering changements will occur, the boost will still not push you even if you keep the filter during a whole tenth of a second. So I went back to the one filter way on surf_timewarp and it now works 100% like it always used to, and now I am submitting this stripper config in order to fix surf_lithium2_fix that also does only work 80% of the times in this current state. Last edited by Shadow Sheep on Sat Nov 25, 2017 8:35 pm, edited 1 time in total. It does go without saying I do appreciate the work being put into this...because yeah. All this would've made me snap and kick a puppy. IF...I can...(and I'm not making any promises here), I'll toss a few out myself. The maps has two problems. The first is that the stage order is randomly generated once the map starts. The second is that the ending has buttons and a teleport that have effect on players, like flashing or shaking the screen, or simply teleport them into a jail. Now the map should totally be playable after this. Now that I think of it, this is unnecessary because if you go from lets say stage 3 to stage 5 start without going to stage 4 start, it will start a stage 5 run without making the stage 3 time count. But I guess I made the stripper config for it anyway. Last edited by Shadow Sheep on Sat Nov 25, 2017 9:29 pm, edited 1 time in total.